At the start of a week of Trestle Summer School, 2nd August 2010, twelve children aged 5 to 10 meet an artistic team of director (Emily Gray), performer (Georgina Roberts) and musician (Philippa Herrick) and take inspiration from Lewis Caroll’s Wonderlands of both Alice and Through the Looking Glass. 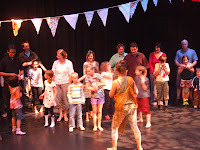 A question: can Trestle fully immerse the group in a world in which the artists share theatre techniques and the children make sense of them to create a thoroughly enjoyable week long theatrical experience? Another question: can Trestle achieve the challenge of researching our next show for this age group without distracting from the major theme and ambition? Day 1 – We begin with: a theatre building set up to be explored, a group of expectant children, most of whom do not know each other and the dramatic arrival of our performer, falling down the tower of the refurbished chapel, Trestle Arts Base. This character asks ‘Who am I’. ‘Where am I?’ ‘What am I’ and as we move around the building, following the clues and sounds of the White Rabbit, the children embrace the mission to discover who this intruder is by showing us who and what they are. We end up in the theatre, which has become an installation of Wonderland and the children readily enter the otherness of this world; the contrariness of Wonderland is soon shared between us as each child is measured in vegetables “you are a runner bean”, “you are three beetroot's and a spring onion” and umbrellas become banqueting dishes, apples become powder puffs and recorders become hat stands. The intruder is named Ah-Um by the children and some secretly suspect she might be Alice. Day 2 - No time to dwell on identity today; time has indeed fled and we are in the kingdom of the Red Queen. The terrifying and absurd monarch arrives and we discover it is her birthday, so games are to be played, rules to be made and unmade, winners and losers to become muddled and heads to be chopped off. The children adapt games to suit the Queen, for example, “What’s the time, Mr Wolf?” becomes “How many jam tarts have you Red Queen?” to which she replies, “A crumb, a puff of flour, a smear of jam”. She commands us to learn Spanish rhythms and flamenco poses, so a bull fight can be played out before her. A Jabberwocky made out of a parachute with bins for eyes is made; it dies and there is much galumphing. Day 3 - The White Queen celebrates her non birthday and we enter her wood, full of tissue paper petals, ethereal sounds and strange creatures. Imaginations run wild as we create hand creatures inspired by Indian mudras (hand gestures) and body monsters made by four hand creatures evolving into a shape made by 4 bodies. Junk puppets are made and brought to life through breath and sound led interactions. Instruments are also given breath and move as if they were creatures, making sounds and conversations. The creative brilliance of the children is evident in their ideas; one suggests an auction in the wood of the White Queen and the group invent objects which were then bid for, not by monetary value, but by crowns, jewels, sneezes and cosmic entities. Day 4 - With the presence of the White Rabbit comes a chorus of rabbits, caught frozen in the headlights of the imagined Red Queen’s stare. Masks are worn and worked with as the group prepares entertainments for the imminent tea party of the Sad Patter, no, the Glad Matter, no, the Rabbit just can’t get his words out right so nonsense is spoken and understood by all. We borrow ideas for entertainments from Oscar Wilde’s short story, The Birthday of the Infanta, which conjures a world not too far from the strictures and absurdities of the Wonderland gardens and courts. Day 5 - At last the most frequently requested character of the week arrives, the Mad Hatter himself; he is eccentric and Scottish, unnerving and charismatic. He helps the children to create the experience that they want their parents to have in the afternoon; he is demanding and kind and then he falls asleep, leaving them to set up for their performance. There is no script and there is no rehearsal. The week’s work has been grounded in Trestle’s approach to physical theatre, creative learning and storytelling. We invited the children in as individuals and demanded from them the depth of creativity and bravery we would expect from an adult professional. If we as professional artists have engaged and guided the young people in skilled way, then this culmination of the process will genuinely show the audience what the week has been like and draw them too into experiencing Trestle’s work. In come parents, grandparents, carers and aunties for an hour of the utterly unexpected; experiential live art meets physical theatre performance in an installation setting. Trestle have lost the children in Wonderland and the audience have to coax them to appear – in dappled light, poems of defeating great beasts are told, the children lecture their parents on the exotic puppet creatures of the White Queen’s wood, the adults dance to the demands of the Red Queen and suffer elimination, the Mad Hatter invites us all to a virtual tea party. Only once the entertainments have entertained, culminating in the futterwaken fashion show, can the real tea, cake and jam tarts arrive and be shared by all. 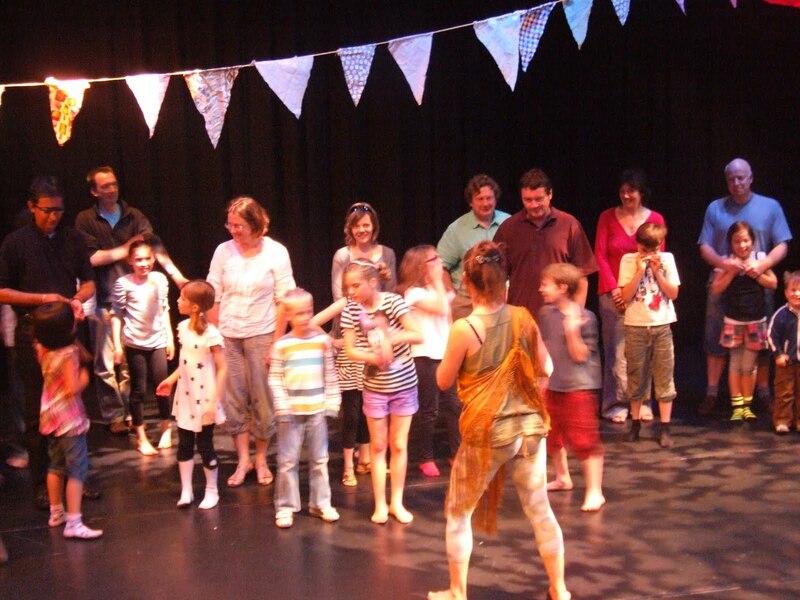 Parents comment on their children coming home each day with questions the adults cannot answer, the performance opens some parents’ eyes to new types of theatre; the children also appear to have grown each day. There has been great enjoyment and in terms of creative learning many valuable life skills have been developed, we hope with a lasing effect. The performer has delivered brilliant performances in role, becoming a different character each day, all of which the group has engaged and improvised with. The musician has used exemplary facilitation skills; encouraging instrument playing and rhythmic performance which are story based and musically open. As director, I have shared the physical theatre skills that Trestle uses and supported the children in their play with them. He showed increasing enthusiasm as the week went on. He was desperate to come from about 8am every day. Absolutely loved it and had lots of fun. What the children brought to it was genuinely integrated into the work; it was far more than a workshop!